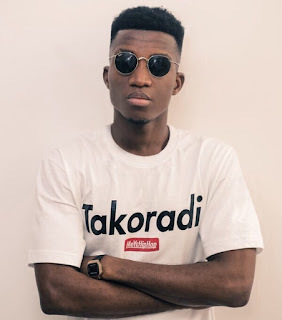 Ghana’s punchline king, Kofi Kinaata has set another record with his love song ‘Sweetie Pie’ as the first audio slide of a Ghanaian Artiste on YouTube to hit 1 million views. The love song which describes Kinaata’s perfect type of lady has received commendations from bigwigs in Ghana’s Showbiz as the most creative song ever. In Ghana, weddings and marriage ceremonies in Ghana are incomplete without ‘Sweetie Pie’ on their playlist. Rap legend Okyeame Kwame has said that the rap verse of ‘Sweetie Pie’ is one of the most creative rap he’s ever heard. Even though the song has no video yet, the management of the Artiste created an audio slide to complement the audio on YouTube and that audio slide has now reached a million views on the video blog. “I am most grateful to my fans and everyone who watched the audio slide on YouTube. We’ve reached this far by your support and I’m forever indebted” Kofi Kinaata, the youngest Ghanaian Artiste to win ‘Best Song Writer of the year’ twice in a row said. A close member of Kofi Kinaata’s management has hinted that a remix of ‘Sweetie Pie’ with one of Africa’s best Artistes and a world class video is in the the pipeline.